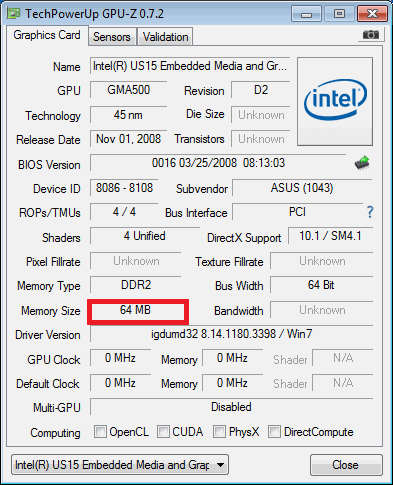 Intel GMA 500 Driver Optimized for MS Windows : GMA 500 vs GMA 600: Is it Overclockable? GMA 500 vs GMA 600: Is it Overclockable? From the first time i got GMA 500 i understood that the only way to increase performances were overclock and a good driver.Today I'll explain my dubt about these two GPUs: GMA 500 vs GMA 600. 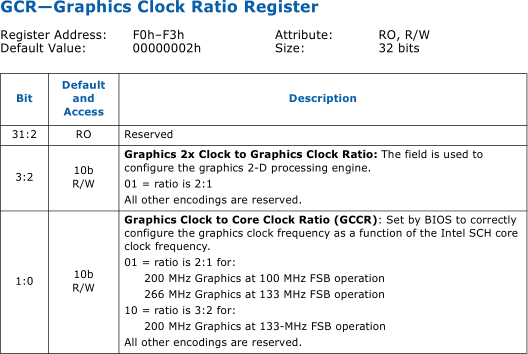 Looking for how to overclock video card i've find some interesting informations. From intel documents: GMA500 can be clocked @266MHz but all other frequencies are reserved.I've try to look at gma600 documents but i didn't find nothing about it. Looking for any solution i've studied different programs(GmaBooster and SetIGP utility develop mainly for i945) and intel documents. 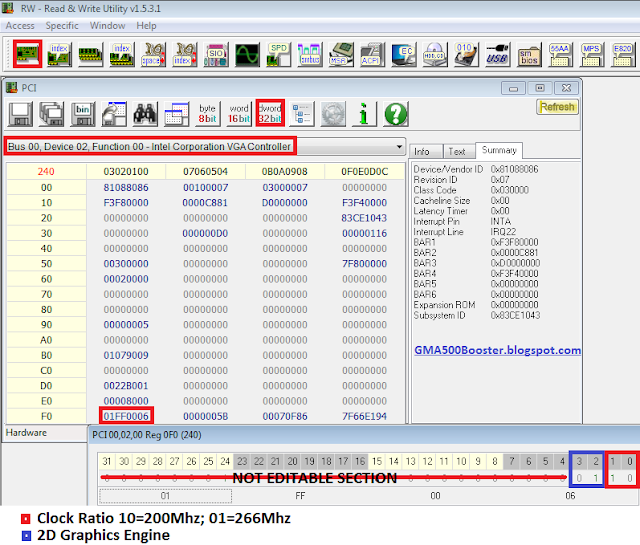 GMA500 Hidden Settings is an easy EXPERIMENTAL tool to modify Intel GMA 500 Settings. The Program isn't for common users but only for people who like testing at OWN RISK! Note.Restarting notebook all hardware values will returns to DEFAULT! For Software Section use Windows Regestry. Read this POST to know the story project. Note.Some Windows Tools may not work on older Windows O.S. Note. Triple buffer works also on Win XP. -Memory Preallocated is RAM stolen given to GPU during boot system. -WPF Harware Acceleration: You should find a wpf application to test. Default is enabled. -Performance Mode: Default is enabled. -Vsync Fix+Triple Buffer: When you saw an image with misalignment can be a Vertical Sync problem and with this solution vsync will be enabled in postprocessing. 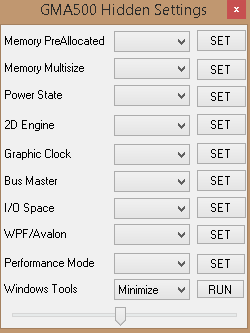 Triple Buffer is used to reduce the fps drop down with Vsync. DSDT (Differentiated System Description Table) is a part of ACPI (Advanced Configuration and Power Interface) stored in BIOS. Probably these strings determinate when the video card is enabled\disabled but i can't be sure. If anyone know something can write down here! Grazie. Ti ho risposto via email oltre a quello che ti ho chiesto potresti inoltrarmi anche uno screenshot della tabella riguardante intel vga(quella dove hai clickato il tasto save). All start from Gmaboost an overclock tool for intel 945: it use this syntax with rweveryrhing 1.4.9.10: wpcie 0 2 0 0xf0 0x0; wpcie 0 2 0 0xf1 0x60; wpcie16 0 2 0xf0 0xvalue; wpcie 0 2 0 0xf1 0x05 (value is different for 400mhz=33, 200mhz=34, 250mhz=34). This method is not valid for gma500 cause is a different platform where the gpu clock is design by F0-F1. Another way is to try changing these 4values from intel vga with default setting but actually i can't cause i don't have my netbook. It's better you wait me cause i have no fear to brick my device) but need 1month to returne at home. To tell the truth I doesn't much believe to OC my Nokia Booklet coz of soldered RAM. While I wait for WinXP driver to try it on Vista with native GMA500 Vista driver OC cause freeze Windows. Trying to change values you point start from 06 change to 00 and I got white screen. This is quite differt from normal OC. Improving FSB you speedup all devices but you can also have more problems from hardwares. With this solution you don't improve fsb,it changes only Gma frequency. There are no other solutions to speedup GMA500! This is the last and i don't know if it can works! Can i install win7 54 bit on my inspiron mini 1010 ? If i can is it faster than 32bit?